Comments about Noble Group and short sellers.. Comments about listings and delistings. Comments about the implications of Stock-Connect for Singapore Exchange. TV interview about my work on Alibaba’s IPO and implications of dual class structure for Asian markets. How Can ICOs Reinvent Themselves? The op-ed article about Alibaba’s IPO and dual-class share structures. The op-ed article about benefits of Islamic finance and what Singapore can do to succeed. The op-ed article about benefits and costs of IPO dual-class share structures. An interview with two of my colleagues and me on Singapore – Malaysia trading link. 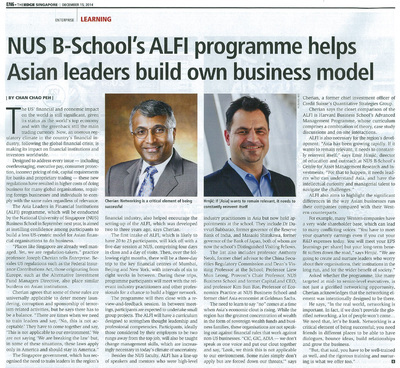 An interview with Prof Joseph Cherian and me on the new Asia Leaders in Financial Institutions programme and some of its highlights. The article features my interview about Alibaba IPO and my media experience. The article features my comments on the potential of Islamic finance in Singapore. 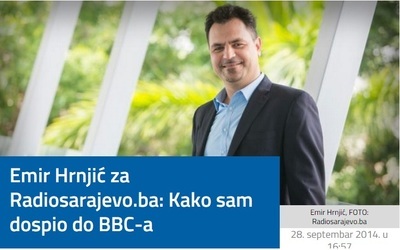 An interview on my thoughts about home in Bosnia and my career. The article features my comments on the side effect of defaults in default-free environment. The article features my comments on tax deduction of debt interest payments. The article features my comments on short-sightedness of “creative” accounting methods. The article features my comments on IPOs, fund raising for private companies and Alibaba’s financing. The article features my comments on higher participation of foreign investors in China’s capital markets. The article features my comments on Chaori’s default and China’s move towards more market-driven economy. The article features my comments on competition among credit rating agencies in China. The article features my comments on firms’ access to inexpensive debt and going private. The article features my comments on the strengths of Singapore's wealth management market.